The Villanova Wildcats have handled opponents all season with elite shooting and rebounding, and the NCAA Tournament has been no different. 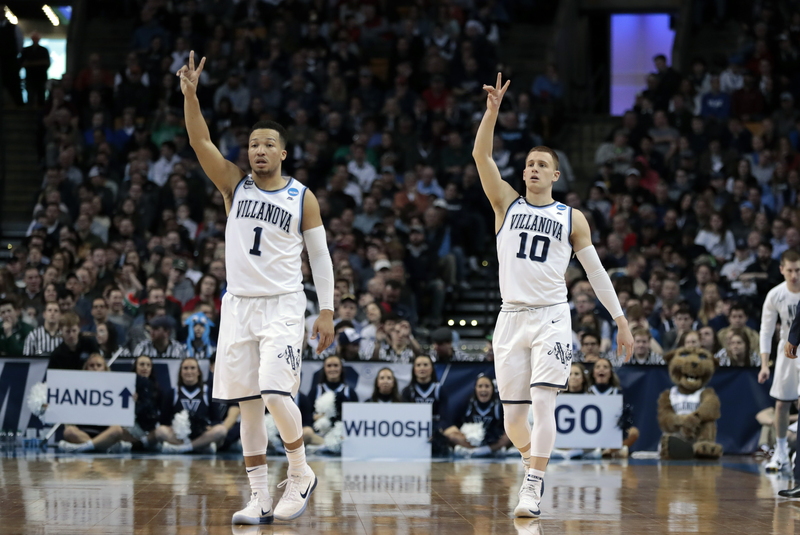 Villanova’s consistency has gotten the Wildcats to this point – another Final Four with a shot at a National Championship. Will they need something extra than what they’ve shown in the tournament so far to get past Kansas? The numbers show that simply continuing the performance Nova has established in the tournament will likely earn Jay Wright’s team a trip to the title game. The 1-seeded Wildcats have outscored their opponents by an average of 15.75 points in their four tourney games, which is right around their season average point differential of 16.4. Their offensive rebound percentage is very strong as well at 37%, up from their season average of 30%. On the glass, Villanova seems to be getting even stronger in the most important games of the year, which could mean trouble for the Jayhawks, and anyone else. Perhaps Villanova’s biggest weakness during the season was a lack of free-throw attempts. Their .30 FT Rate was below the NCAA D-I average of .34. However, in the tournament, Villanova has increased their FT Rate to .37. Wildcat stars Jalen Brunson, Eric Paschall and Mikal Bridges have all gotten to the line often, and the team is shooting 84% from the line in the tournament. The only major statistic that hasn’t improved for Villanova in the tournament is its turnover percentage at 18%, which is right at the D-I average. If Nova can lower turnovers while keeping elevated offensive rebounding and foul shooting, the Wildcats are likely unbeatable. While Villanova has undoubtedly played fantastic, there is some evidence they’ve been a bit lucky as well. Opponents are only shooting 27% from three against them in the tournament. During the season, opponents shot 30% from three, so Villanova has proven to be a great 3-point defensive team, but it’s unlikely that Kansas will shoot that poorly. Villanova’s own shooting is well in line with its season averages, as it has shot 41% from three in the tourney versus 39% on the season. The single biggest explanation for the Wildcats dominance in the tournament is their efficiency from three as compared to their opponents. Villanova takes 51% of its shots from three-point land, and with that volume and efficiency, opponents have to hope for a rare cold night for Wildcat shooters for a chance to win. 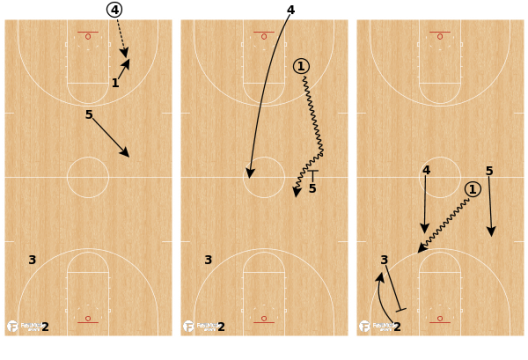 Let’s take a look at some sets Villanova uses to create open looks for its shooters. 1 can dribble either direction. 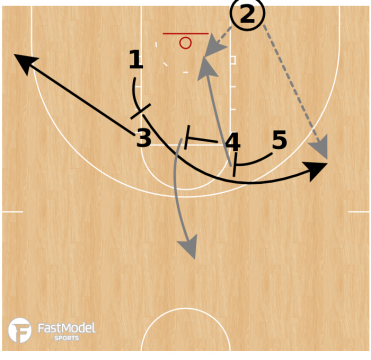 4 and 5 set a stagger away for 2. 1 passes to 2 for the shot. 4 and 5 immediately go set another stagger for 3. 2 passes to 3 for the shot. The Villanova Philosophy: When 5 of your top 6 players shoot 39% or better from 3, you run as many stagger screens and pin down screens as possible to get those shooters open from deep. 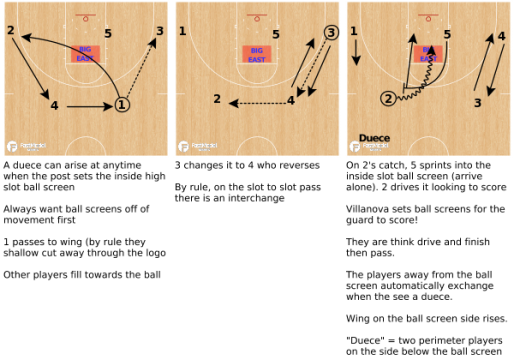 And if the defender shows on the second screen in the stagger, the 5 man slips to the bucket for an easy bucket. This video comes from Nova’s previous tourney run in 2016 when it won it all, but still holds up for how the 17-18 ‘Cats play. For good measure, let’s go ahead and include the epic full court game winner from the ’16 title game that the Wildcats ran with 4.7 seconds left vs UNC. If Villanova continues to do the things that got it to the Final Four, it won’t need this late game heroics.